Please email me for my latest CV. 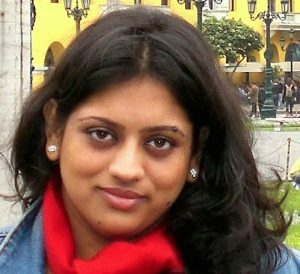 My name is Radha Venkatagiri and I am a Ph.D. candidate in Computer Science at the University of Illinois at Urbana-Champaign. My advisor is Prof. Sarita Adve. My research interests lie, broadly, in the area of Computer Architecture. To be more specific, my main research work is in Reliability, Approximate Computing and Hardware/Software Mechanisms for Error-Efficient Computing. The over-arching goal of my thesis is to build systematic frameworks that enable efficient, automatic and scalable employment of error-efficient/approximate computing for improved performance, reduced energy consumption and better resiliency. [DSN’19] “gem5-Approxilyzer: an Open Source Tool for Application-level Soft Error Analysis” , R. Venkatagiri, K.Ahmed, A. Mahmoud, S. V. Adve, D. Marinov, S. Misailovic, Dependable Systems and Networks, 2019. [DSN ’18] “Impact of Software Approximations on the Resiliency of a Video Summarization System,” R. Venkatagiri, K. Swaminathan, C. C. Lin, L. Wang, A. Buyuktosunoglu, P. Bose and S. V. Adve, Dependable Systems and Networks, 2018. [WAX ‘17] “Leveraging Software Testing to Explore Input Dependence for Approximate Computing,” A. Mahmoud, R. Venkatagiri, K. Ahmed, S. V. Adve, D. Marinov and S. Misailovic, in Proc. of the Workshop on Approximate Computing Across the Stack, 2017. [IISWC ‘16] “Resilience Characterization of a Vision Analytics Application Under Varying Degrees of Approximation,” R. Venkatagiri, K. Swaminathan, C. C. Lin, L. Wang, A. Buyuktosunoglu, P. Bose and S. V. Adve, in Proceedings of the IEEE International Symposium on Workload Characterization, 2016. [WAX ‘16] “Towards More Precision in Approximate Computing,” R. Venkatagiri, A. Mahmoud and S. V. Adve, Workshop on Approximate Computing Across the Stack, 2016. [ISCA ‘14] “GangES: A Hybrid Injection + Program Analysis Technique for Hardware Resiliency Evaluation,” K. S. Hari, R. Venkatagiri, S. V. Adve, and H. Naeimi, in Proceedings of the International Symposium on Computer Architecture, 2014. [MS-Thesis ‘05] “Predicting Compiler Optimization Performance for High-Performance Computing applications using Machine Learning algorithms,” R. Venkatagiri and Y. Solihin, Master’s thesis, 2005. **I am a joint first author on this work.